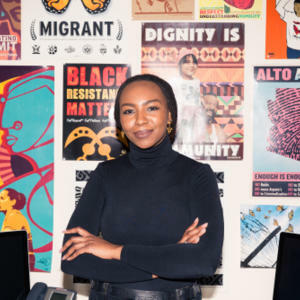 Opal Tometi is a Nigerian-American strategist, writer and community organiser. She is a co-founder of #BlackLivesMatter, a historic political project and network launched to combat structural racism. Tometi is credited with initiating the online platforms and social media strategy during the project’s inception. A millennial trailblazer, she is widely respected for her creativity and bold leadership. At age 28 she became the Executive Director of the Black Alliance for Just Immigration (BAJI) – the United States’ only national immigrant rights organisation for Black people. There she has a track record of successful campaigns that have advanced migrant rights and racial justice. She is currently being featured in the Smithsonian’s new National Museum for African American History and Culture (NMAAHC) for her catalytic contributions to modern day social movements. An international thought leader, Tometi most notably addressed the United Nations General Assembly, a privilege only a few US Black leaders have been afforded. Tometi has appeared on CNN, MSNBC, BET and her words have been published in popular outlets such as Cosmopolitan, Huffington Post, and TIME magazine. She has received several awards and recognitions for her human rights work, including being named 'A New Civil Rights Leader' by CNN, the Los Angeles Times and ESSENCE magazine for her cutting-edge work. In 2016, Tometi, alongside her fellow BLM co-founders, received an honorary doctorate, the Glamour Magazine Women of the Year Award, BET’s Black Girls Rock Community Change Agent Award, and recognition by Fortune, POLITICO and Marie Claire magazines for being among the world’s 50 greatest leaders. A sought after orator, she has spoken at the University of Arizona’s commencement ceremony, the Atlantic Washington Ideas Forum, Harvard University, Yale and universities nationwide. Tometi has been active in social movements for nearly 15 years. As a committed champion for justice globally, she is a member of the Pan African Network in Defense of Migrant Rights, Women in Migration Network (WIMN) and is a board member of the new Atlantic Fellowship for Racial Equity (AFRE), an initiative working with seasoned activists in South Africa and the United States. Tometi holds a Bachelor of Arts degree in History and a Masters of Arts degree in Communications and is a racial justice communications consultant. The daughter of Nigerian immigrants, she came of age in the deserts of Arizona. Although often traveling around the globe to support human rights activists, she resides in Brooklyn, New York where she loves riding her single speed bike and collecting African art.